Aion 2.7 Official Patch Notes – As our continuing coverage of Aion Patch 2.7 continues (check out our hands-on experience with 2.7 here), we feel it necessary to post the Official Patch Notes now that they are live! 1. Following recent events in the Crucible Challenge, the Empyrean Lords have created a Crucible Coliseum. 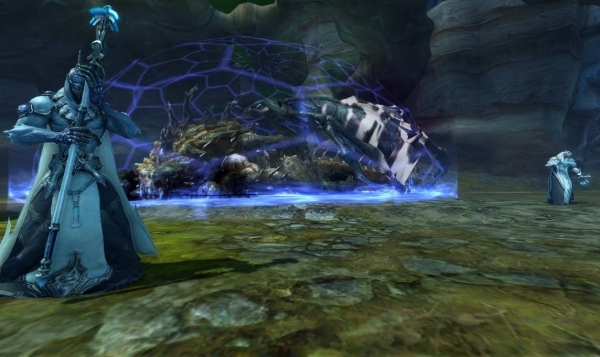 Upon investigating Vanktrist, the monster who had breached the Crucible Challenge, both the Elyos and Asmodians discovered a new rift that connects Elysea and Asmodae. 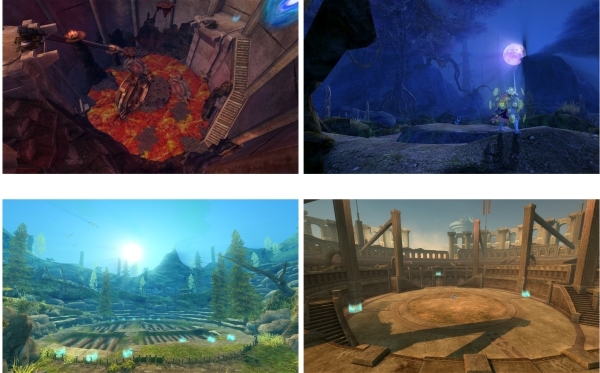 It is here, on top of the rift, that the Elyos and Asmodians built the Crucible Coliseum. This new arena encourages Daevas to grow stronger and mightier through training that simulates real combat. Daevas can enter the Crucible Coliseum through the Kaisinel Academy or the Marchutan Academy. They will also need an Arena Ticket to enter this area, which can be acquired through quests. – The Crucible Coliseum is a timed instance where players fight each other to the finish. There are 3 rounds of combat, and the instance will end either when one of the players reaches the number of points needed for victory, or when the time runs out. – The Crucible Coliseum is divided into two types of arena – the Arena of Chaos and the Arena of Discipline. Players can use the same Arena Tickets to access both Arenas. – To participate, players must be at least level 46 and not in a group. Players can request duels with different people based on character level. – You can only enter the Arena of Chaos and the Arena of Discipline at certain times. – Acquire Arena Tickets via the following quests. – Each Arena Ticket will last for 7 days if not used, at which time it will disappear from a player’s cube. 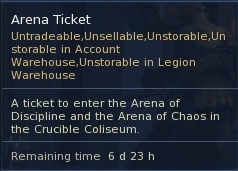 – If you enter the Arena of Chaos or Discipline carrying multiple Arena Tickets, the one with the shortest time left on it will be used first. – There are a total of 3 rounds. – Each round has a time limit of 3 minutes. Once the time is up, you will automatically move on to the next round. – If you change stages or resurrect after dying, your character will receive a temporary revitalizing buff. – No chatting (including chat channels) is allowed in the Crucible Coliseum.  Killing another player or a spawned monster.  Gathering gatherables or activating a variety of devices.  Dying at the hand of another player, monster or device. – Additionally, at the start of the third round, the character in last place will receive a strengthening buff. – Ranks are determined in the Arena by adding points acquired during combat with bonus points for time remaining. If two people are tied for points, priority will be given to the player with the most kills. – Players who leave the Arena during combat or get disconnected from the game during the final tally will not be able to receive any rewards. – You cannot use certain skills or items in the Crucible Coliseum. 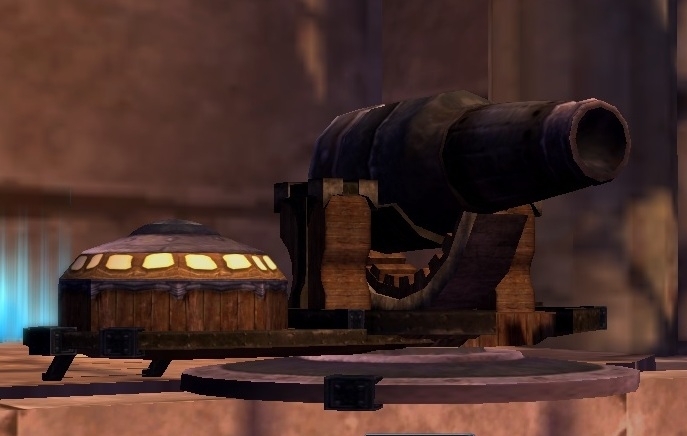 – There are Empty Antiaircraft Guns placed in certain areas of the Crucible Coliseum, which players can use.  Click on the ‘Empty Antiaircraft Gun’ and your character can board it. You will have use of the weapon for a short time, until ‘board mode’ expires.  While using it, you cannot use normal attacks or attack skills, only the gun’s skills. – There are training grounds of Chaos and Discipline separate from the Arenas in which your character can gain a variety of experience. – These practice areas are available at all times and have a very short re-entry cooldown. 2. A new look for ‘Padmarashka’s Cave’ in Inggison/Gelkmaros. Tiamat’s Army was unable to stop the flood of Daevas into Inggison and Gelkmaros, and the Balaur lost a great deal of territory. Tiamat, concerned for the safety of the Dramata (which gives birth to the Drakan), ordered its transfer to a safer location where it would be concealed from the Elyos and Asmodians. Because of the urgency of the move, Tiamat ordered the Dramata to leave behind their remaining spawn. Sematariux was obsessed with its failure to become a Balaur and with inflicting on the Elyos and Asmodians the same pain and rage that lived within it. It continued its attempts to extend its life for even a moment longer, and did not care about the spawn it had left behind. But Padmarashka could not abandon its spawn. It believed that until its final breath, it had a duty to protect them, and swore not to leave the cave until the last one hatched. – Padmarashka, an existing field boss monster, boasts great strength. But it unveils a new look as the boss monster of ‘Padmarashka’s Cave’. – The existing item ‘Sematariux’s Hideout Key’ will now be changed to ‘Padmarashka’s Cave Key’. 3. 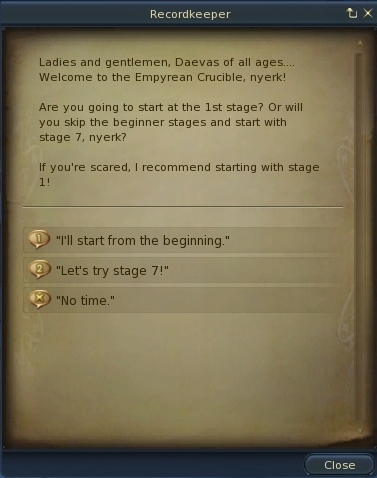 Players can now choose whether to start at Stage 1 or Stage 7 when entering the Empyrean Crucible. – If you start at Stage 7, you cannot acquire points from Stages 1~6. 4. Killing Vanktrist in the Empyrean Crucible now awards the player with more points. 5. There is now a set chance of the Tahabata Repelled Scroll being dropped during the Empyrean Crucible Stage 9 Bonus round. 6. Fixed a bug where a manually formed group, which then entered the Empyrean Crucible using the auto group system, would occasionally get kicked from the instance. 7. If a match ends while you are dead in the Dredgion or Chantra Dredgion, you were still able to use a Reviving Elemental Stone if you had it in your possession. This has been fixed. 8. If a player entered the Dredgion while in the Empyrean Crucible, the UI for the points score would not get adjusted. This has been fixed. 9. After the outer wall of the Esoterrace Bio Lab collapsed, some of the remaining fragments were occasionally visible. This has been fixed. 10. Fixed an error where players sometimes couldn’t enter the Sky Temple of Arkanis or Adma Stronghold with their group members. 11. Fixed an error causing the door leading to the ventilation duct in the Esoterrace not to open even when Captain Murugan had been defeated. 12. Enabled players to obtain one Worthiness Ticket item from the Ornate Treasure Chest if they pass the Empyrean Crucible Stage 7, Round 5. 13. Changed the location where players are placed when they enter Esoterrace to near NPC Nepion. 14. Fixed a bug that kicked the entire group or alliance out of an instance if members were changed or added after entering the instance. 15. Changed the system message displayed when there are not enough group members during auto grouping. 1. Added Crucible items for purchase. – New items that can be purchased with Crucible Insignias and Courage Insignias. – Certain weapons and armor can be conditioned to level 2 with Crucible Insignias. – Certain basic Conditioning weapons/armor can be taken to an NPC and traded in, along with some Crucible Insignias, for an upgraded version of the item. – The upgraded Conditioning item received through the Upgrader has different stats than the other 2nd level Conditioning items available for purchase with just Crucible Insignias. Because the upgraded item is considered a new item, you cannot retain enchantments, manastones, godstones and combinations that were applied to the surrendered item. If you condition an item up to Level 2, both the Level 1 and Level 2 conditioning stats will be applied. – Added items that can be conditioned up to Level 2.  Conditioning items can be purchased from General Goods Merchants. – Added Fabled accessories that can be purchased with Crucible Insignia. 2. Modified the existing Eternal items dropped by Padmarashka, and added new ones. – Added Eternal class armor. – Replaced the existing Eternal class weapons with new ones. – The new Eternal items are untradeable. 3. Added and modified Eternal items dropped by Enraged Veille and Enraged Mastarius. – Modified the stats of the Eternal armor. – If you already have an older version of this armor, its stats will not change. – Replaced the existing Eternal weapon with a new one. 4. Modified the stats of Laestrygos’ Mirage items. 5. The existing scroll items Kaisinel Academy Teleport and Marchutan Academy Teleport used to be purchasable only with Crucible Insignia. Now, they can be purchased with Kinah. – The scrolls can be purchased from General Goods Merchants. – The scrolls are now tradable. – The scrolls can only be used by characters of Level 45 or higher. 6. The Blessing of Concentration and Blessing of Devotion Effect items (used on Veille’s Aetheric Concentrator) will no longer be available for purchase. However, if players already own these items, they will now be able to sell them in a store. 7. Fixed a problem where certain items would appear distorted when equipped. 8. Fixed an issue where dye could not be applied to some items that were intended to be dyeable. 9. Fixed a bug that caused some weapons to produce the wrong Godstone effects. 10. Fixed a bug where some clothing items were not displayed properly when worn. 11. Added new Platinum Medal Chests containing Platinum Medals. 12. You can buy Platinum Medal Chests with Crucible Insignias or Courage Insignias. 13. Fixed a problem where some item effects were not displayed properly. 14. Fixed a bug causing the appearances of some items not to display properly. 1. Buff pets will no longer automatically buff their masters while the player is flying or gliding. 2. Fixed a bug with fortune pets where the time remaining to feed them again would be incorrect if a player disconnected and then logged back into the game after feeding the pet until it was full. 3. Added more items to the reward bundle given out by the Runaway Poppy pet. 4. Fixed a graphics bug that sometimes occurred when pets attempted to fly. 5. Fixed an error causing the wrong system message to display when using the Pet Mood command for some function pets. – Gladiator skill ‘Daevic Fury I’. – Templar skill ‘Hand of Healing I’. – Ranger skill ‘Destruction Trap I~III’. – Assassin skill ‘Wind Walk I’. – Sorcerer skill ‘Tranquilizing Cloud I’. 2. Increased the duration of the Movement Speed Reduction of the Ranger skill ‘Call Gryphu I’ from 2 seconds to 3 seconds. – Ranger skill ‘Nature’s Resolve I’, from 10 minutes to 5 minutes. – Assassin skill ‘Apply Poison I~IV’, from 2 minutes to 10 seconds. – Assassin skill ‘Apply Deadly Poison I~IV’, from 2 minutes to 10 seconds. 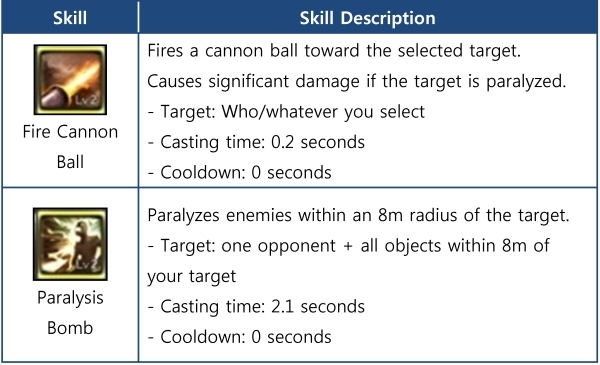 – Assassin skill ‘Blinding Burst I’, from 10 minutes to 3 minutes. – Assassin skill ‘Quickening Doom I’, from 1 minute 30 seconds to 1 minute. – Spiritmaster skill ‘Armor Spirit I’, from 5 minutes to 1 minute. – Chanter skill ‘Blessing of Wind I~V’, from 1 second to ‘Cast Instantly’. 4. Increased the Magical Accuracy of all the Ranger’s ‘Trap’ skills. 5. The Assassin skills ‘Dash Attack I~IV’ and ‘Throw Dagger I’ no longer share a cooldown timer. 6. The Elyos Cleric skill ‘Slashing Wind I~II’ and the Asmodian Cleric skill ‘Punishing Wind I~II’ no longer share a cooldown timer with ‘Hallowed Strike I~V’. 7. Increased the range of the Cleric skill ‘Divine Spark I~III’ from 15m to 25m. 8. Increased the accuracy of the Chanter skill ‘Binding Word I’. 9. When using the Ranger skill ‘Seizure Arrow I’, the wrong system message would be generated. This has been fixed. 10. Increased the accuracy of the Assassin’s Rune Carve type skills. 11. Increased the stun rate of the Assassin’s Ambush III – VI skills. 12. Increased the attack power and HP drainage of the Asmodian Assassin’s skills Darkness Rune I and Rune Swipe I. 13. Fixed incorrect tooltips about the materials for Assassin’s Apply Deadly Poison I and Apply Lethal Venom I – IV.  Added an effect to ‘Protective Ward’ I – VI that increases resistance to Stumble.  Reduced the casting time of ‘Recovery Spell’ I and II from 1.5 seconds to 1 second.  Reduced the cooldown time of ‘Parrying Strike’ I and II from 1 minute to 30 seconds. 15. Corrected the effect range of Asmodian Cleric’s Summon Healing Servant I and II skills. 16. Removed inappropriate system messages that used to be displayed when you used a skill increasing Enmity. 1. Added new quests related to the Crucible Coliseum instance. 2. Added new quests related to the Padmarashka’s Cave instance. 3. The monster in the Sematariux quest now has a different name when it leaves its hideout. 4. Made some changes to quests related to Stormwing in Beshmundir Temple. – Quest modified: Even without completing the quest at Beshmundir Temple, you can activate the Rift Orb. – Quest added: After completing the final quest in the ‘[Group] Magical Essence’ (Elyos)/ ‘[Group] Opening the Prison’ (Asmodian) quest series, you can accept an additional reward quest that allows you to acquire XP and items. 5. Modified the ‘Agent’ quests that you are able to acquire when your faction occupies all fortresses in the opposing faction’s territory in Balaurea. If you have already acquired one of the existing quests, then it will automatically be replaced with the new one following the 2.7 update. – If you help the Empyrean Agent to successfully defend the castle, an Adjutant will appear. Speak to the Adjutant to receive items and XP for your help. 6. Modified some of the Asmodian daily/weekly mentor quests. 7. Modified the Inggison and Gelkmaros daily/group quests that give Platinum Medals as rewards so that everyone in the group can acquire the quest items dropped by monsters. 8. Modified the number of Platinum Medals you can earn as rewards for the alliance, league, spy and daily quests in Inggison and Gelkmaros. 9. Added new manastones to the level 30, 40, 50, and 60 Manastone and Manastone Bundle quest rewards. – Added Magical Accuracy and Resist Magic manastones to the Level 30, 40, 50 Manastone and Manastone Bundle quest rewards. – Added Magical Accuracy, Resist Magic, and Healing Boost manastones to the level 60 Manastone and Manastone Bundle quest rewards. 10. The [Elyos] Medicinal Tails quest was ending at the wrong location. This has been fixed. 11. In the [Elyos] Someone Superior quest, Titirunerk the Two Faced was recovering HP too quickly to allow players to fight him. This has been fixed. 12. During the ‘Omega’s Fragment’ and ‘Shining Scroll’ quests (which you can receive once you kill the Inggison protector Omega and the Gelkmaros monster Ragnarok), if you lose your quest item, you can get another from ‘Somia’ (Elyos) or ‘Jiana’ (Asmodian). 13. Increased the average number of Gold and Silver Coin Chests you can acquire through existing daily quests. – Elyos Quests: Desert Dangers, Kerubs in Kuriullu, Ettin Jerky, Deathsong Corruption, Dousing the Flame Tribe, Taking out the Trash, The Aggressive Undead, Eradicating Undead, Weapon of Draconute, Termination Klaws. – Asmodian Quests: Protecting Tripeed, Thinning the Ranks, Beluslan Pest Hunt, Combat Miners, Eliminating the Flame Tribe, Putting the Past to Rest, Ghosts of Anair Harbor, Bloodburn Klaw. 14. Fixed an error in which the quest was not updated even if you defeated Icaronix the Betrayer, the quest monster for Asmodians’ [Coin/Group] Menacing Traitor (repeat) quest. 15. Shortened the respawn time of monsters for the daily quests rewarding Platinum Medals in Inggison and Gelkmaros. 16. Platinum Medal Chests can now be purchased from a vendor. Removed the quest to exchange Crucible Insignias for Platinum Medals. 17. 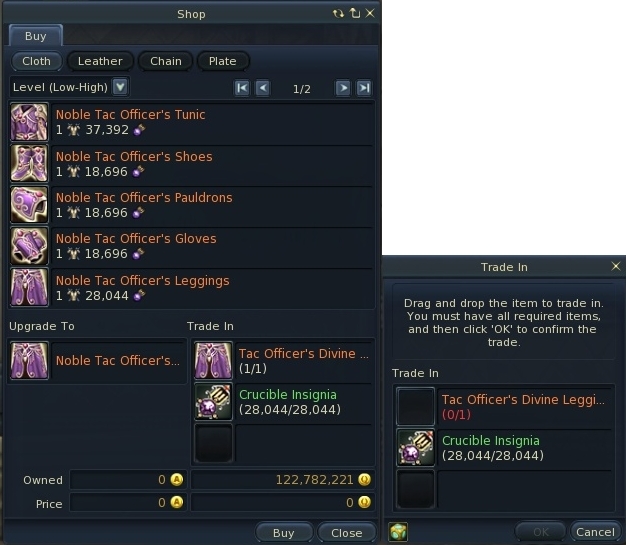 Fixed a bug that updated the Elyos [Inggison Klaws] quest even when you hunted the Inggison Supraklaw Hoarder, not the monster specified by the quest. 1. Modified the number of Platinum Medals awarded for winning a Fortress Battle in Balaurea based on the number of participants and their ranks. 2. Reduced the range in which your contribution is recognized during fortress battles in Balaurea. 3. The rewards given for killing Marchutan’s Agent or Kaisinel’s Agent in Balaurea (when two of the opposing faction’s fortresses were captured) have now been fixed. 1. Treasure Boxes will no longer give relics to players in mentor groups. 2. Fixed a glitch that allowed characters to glide without using up their flight time under certain circumstances. 1. Added an instance zone tab to the map window. – Displays a detailed list of instances, as well as the cooldown times of your group members. – If you select an instance from the list, then the map will show the zone where that instance is located, and the instance icon on the map will blink for a short time to highlight it. 2. Added a function to display a map of the entire area by pressing the shortcut key for the Transparent Map repeatedly.  Pressing the shortcut key will cycle between Small Transparent Map, Whole Transparent Map, and Close Transparent Map. 3. Fixed a bug that closed the Transparent Map during Teleport. 4. Fixed a bug that prevented group members from posting and deleting Group Recruitment Offers. 5. Fixed a bug causing personal notes not to display for characters in the friends list. 6. Fixed a bug that displayed Pet Food items abnormally when you tried to feed a fortune pet. 7. Fixed some overlapping tooltips. 8. Fixed the problem where the loading screen was not displayed during Teleport. 9. Fixed a bug that displayed Pet Minders’ dialog windows abnormally. 10. Fixed a bug that disabled some menu functions after exiting the Plastic Surgery window. 1. Made some changes that affect battles involving ‘Enraged Veille’ and ‘Enraged Mastarius’, when the enemy faction occupies fortresses in Inggison and Gelkmaros. – Removed the powerful skill device that used to be located near the Agent. – Changed some aspects of the mobs’ combat tactics. 3. Prevented Maloren of Interdikah from moving too far away from the Artifact of Transcendence. 4. In Sanctum, relocated the Aethertapping Master and Merchant from the Essencetapping Workshop. 5. Fixed a bug that caused too many monsters to concentrate in certain areas. 6. Prevented the NPCs deployed at the “Daevic Innervation” artifact in the Abyss Top Layer from reappearing in other places. 7. Fixed a bug where Faithful Respondent Utra inside the Oracular Chamber in Beshmundir Temple would flicker, even when he wasn’t moving. 1. Simplified the features displayed on the transparent map. – On the map’s quest indicator, it shows the areas in which you are currently running quests, as well as NPC information. – Location names are now displayed on the map. – Reduced the size of the transparent map for the immediate area. – The transparent map can be moved around when the quickbar is unlocked. – Lock the quickbar to fix the transparent map in place. 2. Added maps for Marchutan Academy and Kaisinel Academy. 3. Fixed a bug that prevented players from opening private stores in some areas where it was intended that this should be allowed. 4. When clicking the Close (x) button on upper right hand corner of the Aion Client, the Client will no longer close right away, but rather will show a timer that counts down from 10 seconds (much like the existing Quit option). 5. Made some changes to the default options in the ‘Game Options’ menu. – Only characters created following the 2.7 update will have these settings by default. The settings you chose for your existing characters will not change. – However, clicking the ‘Default’ button in the lower left corner of the options window will change the settings to the new default value. – The following settings are now turned on by default (for newly created characters after 2.7). 6. Players can now freely teleport to the Cloister of Kaisinel and the Convent of Marchutan, regardless of character level, using the Teleport Statues in the capital cities. 7. Kisks can no longer be placed in certain areas in Inggison and Gelkmaros. – If a player has a kisk in one of these areas when the change is implemented, they will get sent back to the Obelisk to which they are bound when they next log in. 8. Changed the name of ‘Sematariux’s Hideout’ in Inggison to ‘Dramata’s Lair’. 9. Changed some of the floating objects around Verteron Citadel.